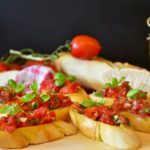 So easy and so delicious, this simplicity of this bruschetta accentuates the freshness of the tomatoes and herbs. In a small bowl, whisk all dressing ingredients together. Set aside. In a large bowl, combine tomatoes, onion, basil, and parsley. Toss with dressing. Slice baguette into 1" slices, place the slices on a baking sheet and bake until bread is lightly toasted, about three minutes. Top each slice with the tomato mixture and serve.